This Brick Truck Walker comes complete with 35 alphabet and 1-9 number wooden blocks. A great educational toy for helping toddlers learn to walk. A truly wonderful traditional blocks walker. The baby walker comes with block shapes ideal for learning and building towers, encouraging counting skills, colour and pattern skills, whilst also encouraging your little ones tender steps! This baby walker is made from high quality rubberwood and will be delight for the young child. 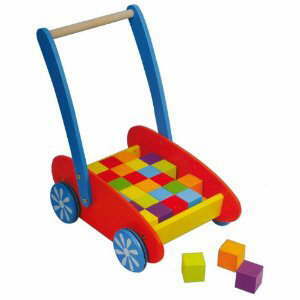 This baby walker with blocks is an ideal educational wooden toy for young children. There are colourful shaped blocks to play with. The wheels of the baby walker have rubber grip for added safety.